During Christmas we try to help families get the funds to take care of any medical needs their cats need. Be it spay/neuter, urgent dental, vaccinations, etc, we do what we can to ease the financial burden during the holiday season to assure their pets remain healthy. Not every pet in America gets what they need medically throughout the year. 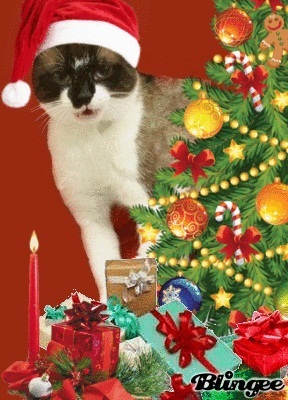 Frisky Felines Foundation wants to make Christmas time for pets in need an important holiday. We raise money to help provide veterinary care for pets that have gone without essentials such as Rabies vaccinations, spay/neuter, health exams, dentals, etc. During our 2 month mission we raise the money to provide the pet owners the funds they need to see that their pets get the care they need, not only does this help the animal, it also helps prevent any legal problems that may creep up. Our goal this year is to raise $1000 in funds to provide basic care for these animals. You may donate financially for medical care or you can send gifts for those pets that will be donated to families at Christmas. If you know anyone that needs medical care for their pets you can have them fill out an application to apply for the Pet Angel Tree. We thank you for helping us help the animals. Remember, we are a 501(c)3 non profit therefore your donations are tax deductible.